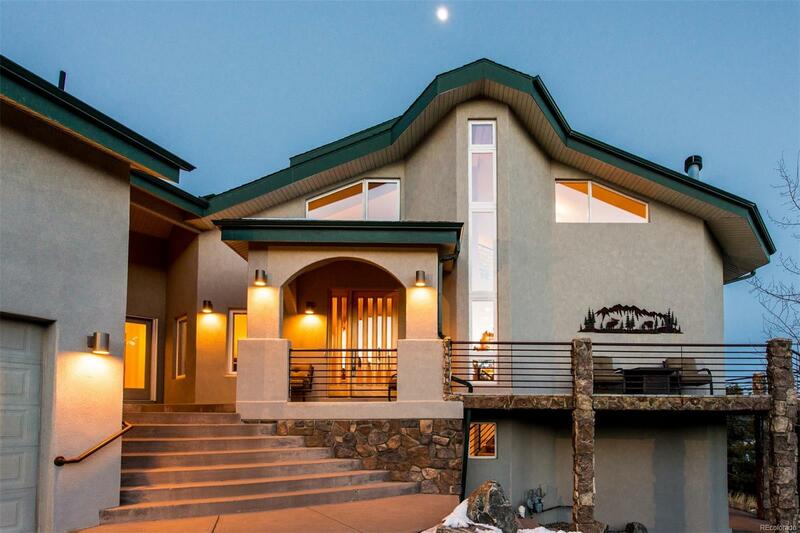 Stunning executive home featuring contemporary and elegant style. Dramatic views. Open floor plan which integrates the gourmet kitchen, dining and living area smoothly with the outside deck and gardens. Fine craftsmanship and attention to detail with a beautiful remodeled kitchen which has been proudly featured in several publications. Vaulted ceilings create a spacious open feel. Ample sunlight throughout the home. Main level master suite, a 5-piece bathroom including a Jacuzzi, cozy setting with a fireplace, private deck, exciting views. Lower level offers a large family room, movie theater with a sound system, a gym, a bathroom with a wonderful steam shower, an additional bedroom with its own private bathroom/walk-in closet. Upper level has 2 more bedrooms with a shared bathroom, ample storage space. Above the oversized 4-car-garage is an ample living room suite with a separate office area and a bathroom which allows for privacy away from the main house. Whole house generator.